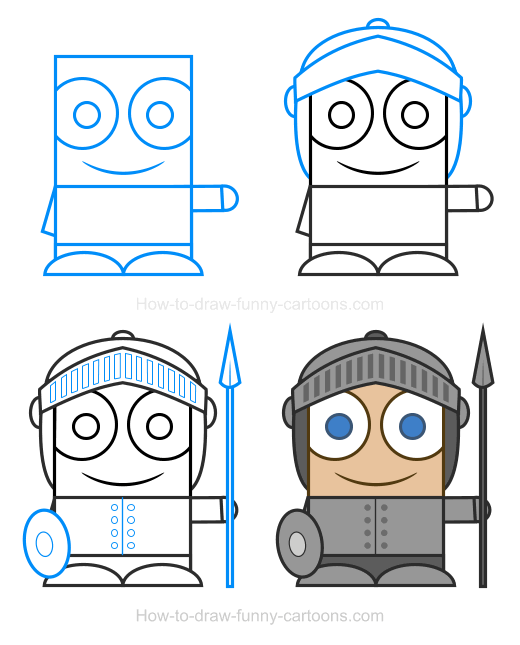 Do you want to learn how to draw simple clipart characters? Would you like to create amazing illustrations using only basic shapes, elements and colors? Great! 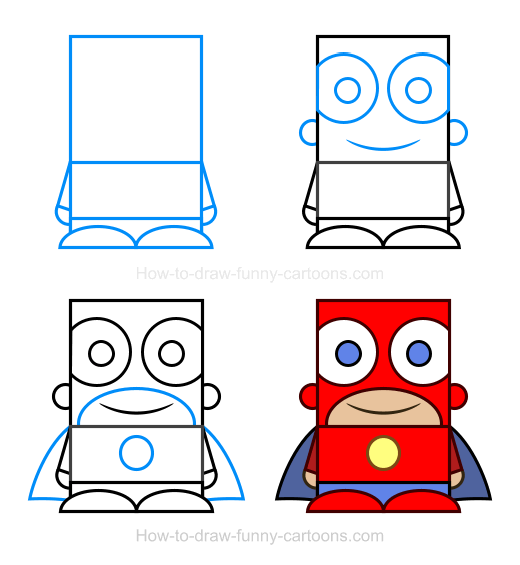 In this section of How-to-draw-funny-cartoons.com, I will show you how to draw several cartoon characters like an alien, a dentist, a firefighter, a clown or a superhero using basic shapes and lines. Fortunately, these lessons are perfect for beginners and are also accessible to young kids. 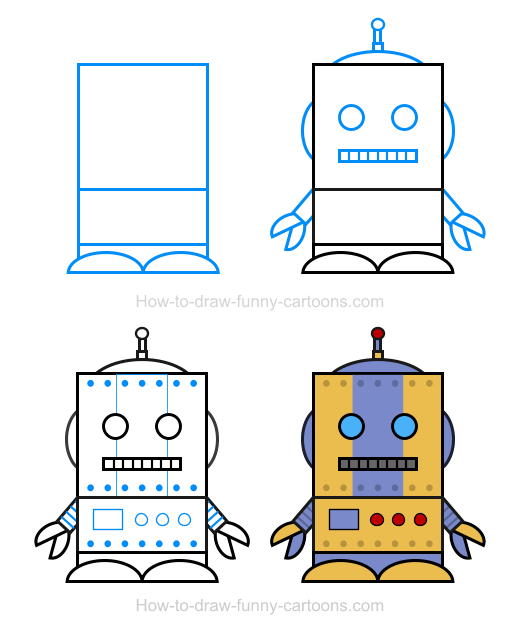 Most illustrations are created from a large rectangles and several small circles making these lessons easy to duplicate. You can either use a vector application (just like I did) to illustrate all characters or draw using a good old pencil and a piece of paper. Relax, take it easy and follow each step carefully if you want to end up with a beautiful cartoon characters. Clipart images are easy to create if you take the time to place all the right elements where they should go. Most characters are done using a similar template, so once you are familiar with a character, illustrating the whole series will be a fun experience. 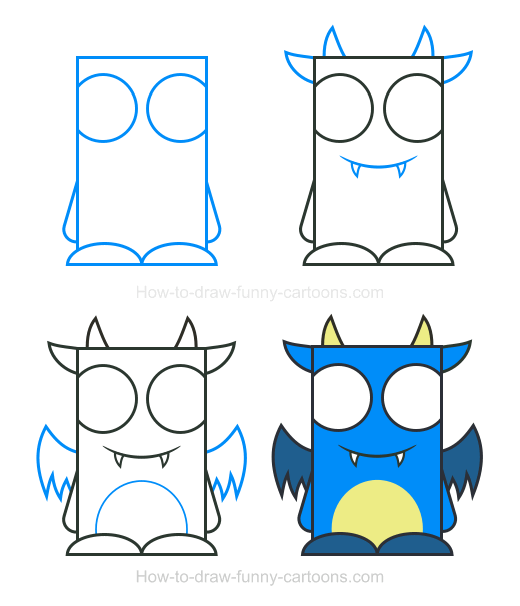 Unlike most lessons found here, these cute characters are mostly done from shapes that have sharp corners (like squares, triangles and rectangles) and that are used in various original ways. Let's study this cute cartoon princess below to see what you should expect from these illustrations. All important body parts are made from rectangles. The head is illustrated with a long rectangle while the body is made from a shorter one. 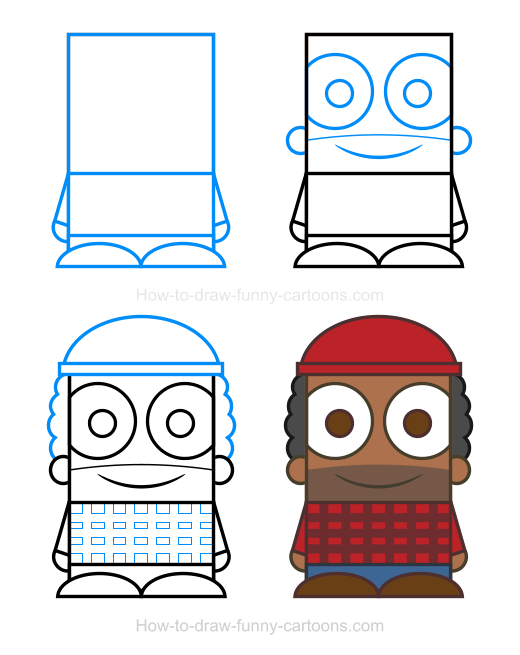 Notice also that all shapes inside this character clipart are filled with plain color. No digital effects (like color gradients) are added. It can be hard sometimes to draw realistic hands in the wonderful world of cartoons. Even simple ones are challenging to achieve. In this case, we can use simple oval shapes to represent this part of the body. It's simple, but still quite effective. 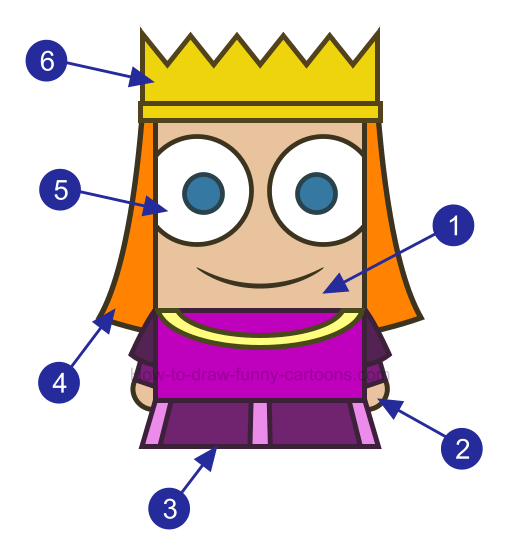 The dress of the princess is made from an irregular rectangle that is much wider on the bottom. 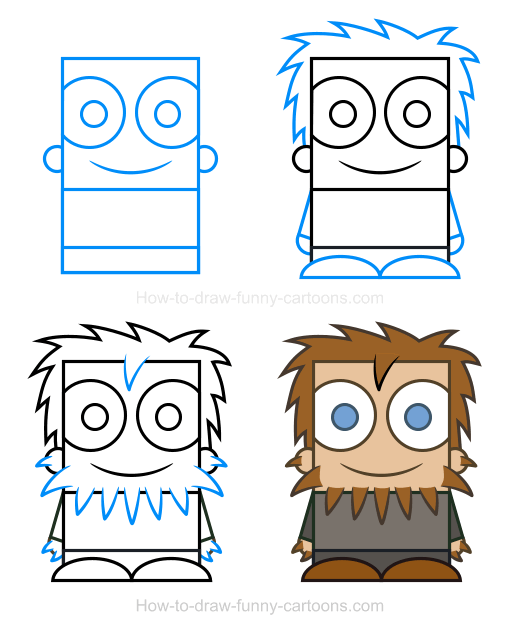 For male characters, only a rectangle is used to form the legs. Feet are made from simple curved lines. Time to be creative! Indeed, you can draw virtually all the hairstyles you want (even if we are working with basic shapes and lines). For this cute character, only a few curved lines are used to form shapes that are filled with a bright orange color. This effect is pretty simple, but results are quite cool! 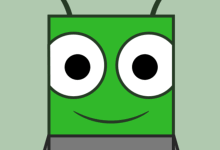 Instead of drawing eyes that are located inside the head without touching the edges, these large eyes are rather cropped by the rectangle used to form the head. You might have to draw a few accessories to make sure your character remains easily recognizable. Whether it's a hat, a special uniform or tangible objects like a sword, these elements are often mandatory. If you prefer to use video lessons to learn how to draw cool cartoon characters, then this simple example can be a good start. You can find more video tutorials like this one featuring misc animals and characters on my Youtube channel. 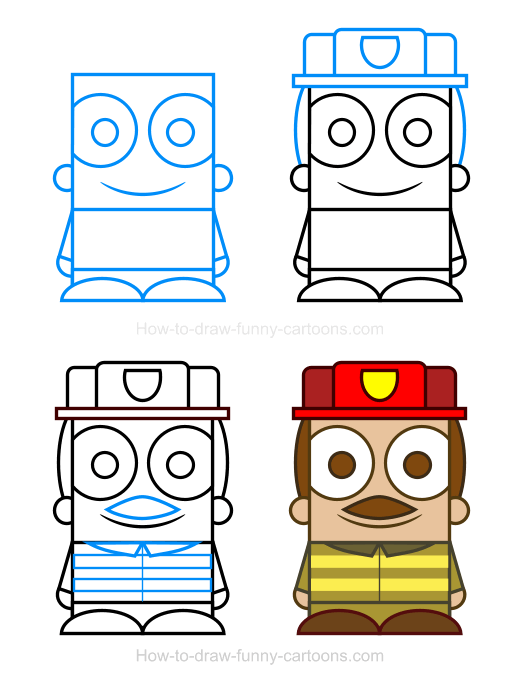 For this first step-by-step written example, we will work with a cute firefighter filled with bright colors. Unlike the female character that was wearing a skirt, this man is wearing pants made from a tiny rectangle. The feet are drawn with oval shapes that are cut in half. 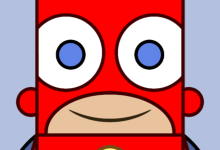 Hair is simple and a thick mustache can be seen above the mouth of the firefighter. The hat and the costume are important to help illustrate this firefighter properly. Just the hat could be enough, but adding a suit is more than enough to make sure this character won't look like something else. 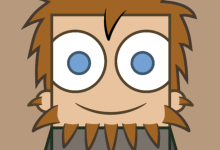 It's funny how a simple element like hair can make a huge difference on a character clipart. Just by adding hair on the ears, the chin and the hands of this intriguing character, we can turn this one from a simple man to a terrifying (well, maybe not terrifying ... but you get the idea) werewolf. You could add more details if you want to (like teeth or a shirt filled with holes), but this version is already filled with all the clues needed to identify this fictional creature quite easily. 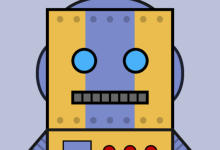 Unlike all previous characters, this cool robot is slightly different. Indeed, we don't see these large eyes that are almost covering the entire head. 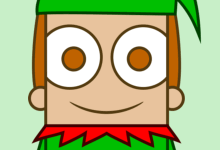 Instead, both eyes are represented by simple dots. The good news is that even if this image is slightly different, it works. We still feel like this robot is part of the same series. Of all robots available on this site, this is definitely my favorite version for sure. It's extremely simple and easy to duplicate and the color pattern (yellow and blue) is nice and appealing. another unique illustration. a fun and lovable monster! This character is also unique for several reasons. 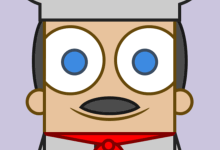 First, instead of having only pupils (like the robot) we can only see the eyes of the creature. Also, hands and arms are making one. Finally, the body and the legs are merged into a single large rectangle. I also really like this fun illustration. Using this template as a starting point, you could easily create thousands of various monsters filled with unique features, colors, patterns or even textures. 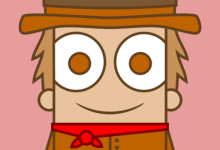 Drawing character clipart images can be very stimulating when possibilities are almost endless! If I would ask you to describe the job of the nice man found below, what would you say? A lumberjack? If so, how did you come up with this answer? It's simple. The pattern on the shirt! Indeed, a simple series of horizontal and vertical stripes (matched with a red shirt) are enough to convert a simple man into a hard-working lumberjack. 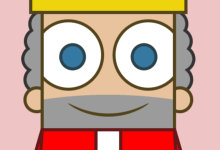 The other fun thing about this character is the addition of a beard. 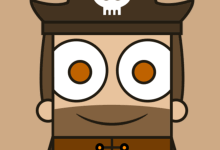 Unlike all other elements from this illustration, the beard doesn't have a stroke or an outline. This time, more accessories are needed! 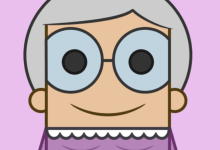 Once again, this character clipart is slightly different from all other for a few basic reasons. First, this knight is wearing a lot of accessories. Besides the armor, the character is also wearing a large helmet, a shield and a spear. All these objects are colored in various shades of grey. Another interesting aspect of the image is the fact that the character is holding a different posture. Sure, only the left arm is raised, but that's still a new thing to consider compared to all previous tutorials. One last (strong) character before the big list! More character cliparts for your to enjoy! All previous lessons were just a small taste of what you can enjoy here. Indeed, you will have access to several more males and females illustrations all drawn using the same basic shapes. It's also a good idea to practice as often as possible. In this case, postures are pretty basic (all character cliparts are shown from a front view) so learning how to draw perfect circles and rectangles is all you need to do. You don't need to be familiar with the human anatomy to create enjoyable characters. You can save this part for later!